Batman takes Robin up to teach him how to repair their satellite during an eclipse. He is later called to the Mount Hope Cemetery where the signs point towards what looks like an outbreak of the undead. Batman of course believes that there is a human explanation for the attack. Still, he orders Robin back to the batcave. While on his way back Robin runs into people running away from what for all intents and purposes looks like an outbreak of the undead. He buys the people time to escape, but falls into the mass of undead. I’m not the biggest fan of zombies there is. I like the basic story structure, but generally most examples of it are too gory for me to properly enjoy. As such I approach this story with some trepidation. Though, to be fair, since this is being published under the DC label and not Vertigo, so I think it’s safe to say this won’t get excessively gory. And therein lies part of the problem. Granted low levels of gore work for me, they don’t quite work for your average fan of zombie fiction. Though I cannot understand it, I do understand that there are people that like gore in their fiction. And for them I can imagine a relatively gore free zombie story won’t work. Part of me thinks that the concept of Batman fighting a zombie outbreak is ludicrous, but then again it’s Batman fighting a zombie outbreak! Even if you think the idea is stupid, and I kind of do, a small part of you and me admit that if this is done right it could be awesome. This is the kind of idea that may work better as an Elseworlds tale, but it would need to be big. 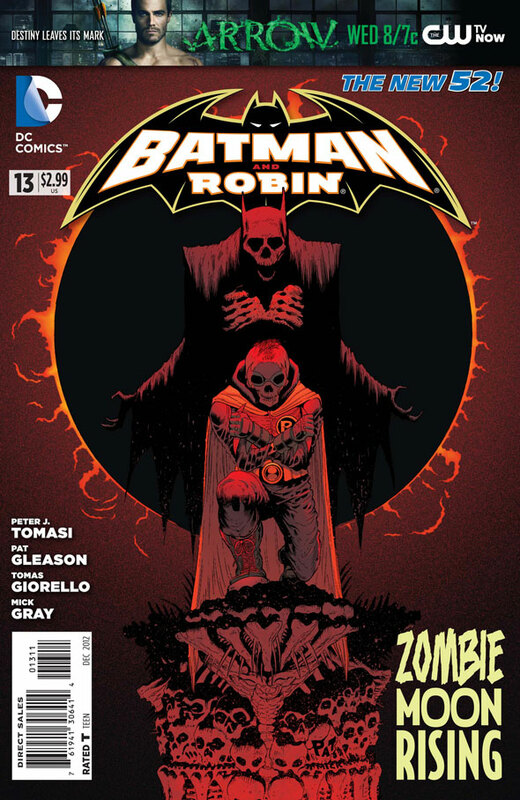 And with the Death of the Family story starting up in the flagship title of this franchise I don’t see Batman and Robin‘s zombie story going very far. Overall it feels like a sensationalist idea trying to bide time before Death of the Family, by taking advantage of the popularity of zombie fiction in the current mainstream. The main problem I’ve been having with Batman and Robin in the past few months is that the past two story lines have been big ideas executed on a tiny stage. Either these ideas need to be given more room, or we need someone to write smaller stories.